ChangeNow.io, a cryptocurrency exchange operating illegally in Russia, is being accused of fraudulently possessing 11 Bitcoins, amounting to $70,000 at the time of exchange. The cryptocurrency ecosystem is largely unregulated, and that has led to the proliferation of scams in this space. On the 4th of July, 2018, a cryptocurrency user with the moniker ni23457 on Bitcointalk.org and Reddit forums, deposited 100 Bitcoincash (BCH) into Changenow.io. The user ni23457 claims he deposited to ChangeNow after confusing them for Changelly, another cryptocurrency exchange that is considered reputable. His problems started when ChangeNow suspended his exchange and disabled withdrawals. ChangeNow asked for his personal identification documents for Know-Your-Customer (KYC), citing trading irregularities and he duly complied. There was an issue with the first set of documents he submitted, and he has since submitted a second set. Unfortunately, ChangeNow.io, has reneged on their promise to pay the funds back to its rightful owner. It’s been a game of cat and mouse ever since, with the exchange making up new excuses to keep funds that isn’t theirs. They claim they are “investigating” the source of funds, but according to n123457, the blockchain clearly shows that he owns the coins. The funds have been dormant in the same addresses for five years, and the presence of many coins in those same addresses indicates that the private keys were not stolen. They are an “anonymous” cryptocurrency exchange, operating from Russia. Additionally, they are currently trying to raise millions of dollars for their token, via an Initial Coin Offering (ICO). The CEO is a resident of St Petersburg, known as Roman Lapin. He also doubles as the CEO of evercodelab.com, a software company in St Petersburg, Russia. It is very likely that both Changenow.io and Evercodelab operate in the same offices, due to them sharing the same CEO. As is often the case in the cryptocurrency community, not much is known about the people behind ChangeNow. There is little information about them, and since these accusations surfaced, they have changed the details of all their known social media accounts. They went as far as redacting their official whitepaper, removing sensitive information about the owners. 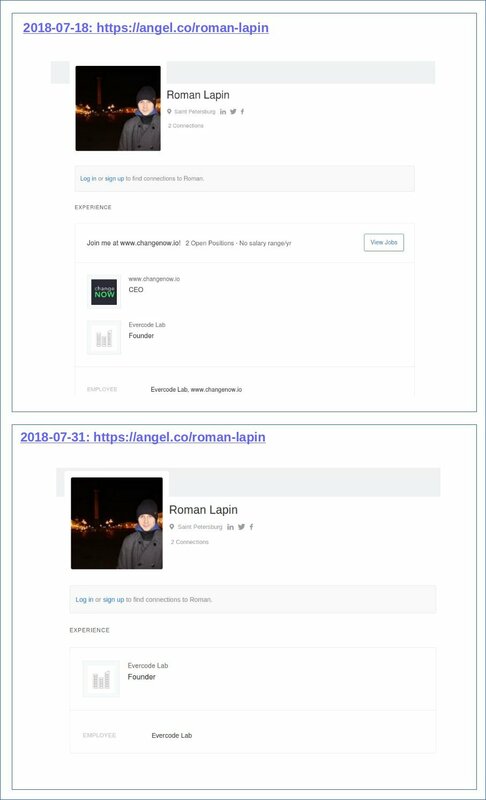 CEO, Roman Lapin, has been desperately trying to hide his connection to ChangeNow. 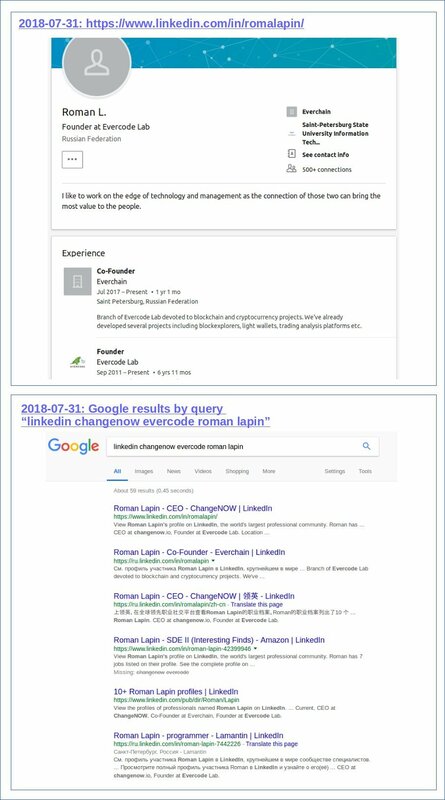 He edited his profiles on angel.co and linkedin.com, to remove traces of ChangeNow. However, anticipating this scenario, ni23457 made several screenshots from angel.co in advance. It is illegal to operate a cryptocurrency exchange in Russia. Up until when the Russian state ratifies its draft law on cryptocurrency regulation, www. changenow.io is operating illegally. 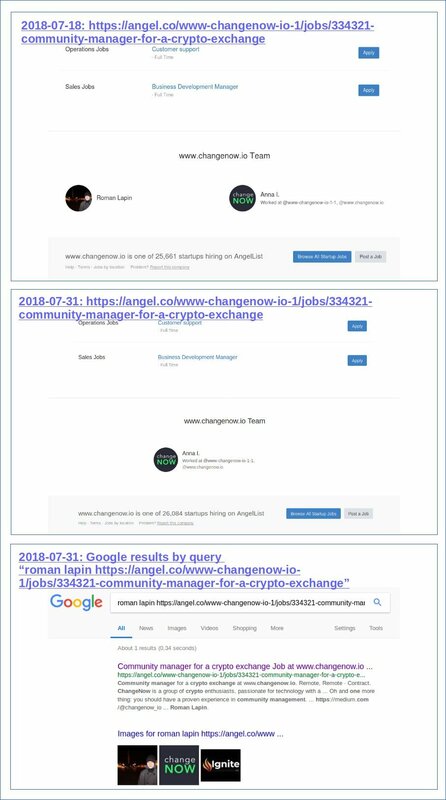 ChangeNow’s response to these allegations is that their company is incorporated and registered under the laws of Belize. And that they operate in full compliance with international AML/KYC directives. They have denied operating in Russia, even though readily available evidence suggests otherwise. Under the circumstances, is it right for ChangeNow, an anonymous exchange, to demand KYC from their customers? Are customers deposits theirs to appropriate for refusing KYC? It begs the question, if it is safe, to send personal identification documents to unknown individuals that are trying very hard to remain anonymous. Changenow.io has no rules, no laws and can arbitrarily seize users’ deposits if they deem it size-able, with no recourse whatsoever to their customers and investors. The problem with ni23457 is in himself. I ask, who will send fake documents, at the risk of losing $ 70,000? I have 2 options. Either this man is insane, or he has something to hide. In addition, STEVEN HALLER is a paid troll that was purchased by ni23457 for the dissemination of false information. As for the legality of changenow, then you do not know anything about this story, so do not write nonsense, misleading people.